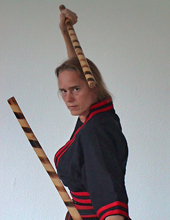 Master Gabriele Roloff began her Modern Arnis training in 1984. 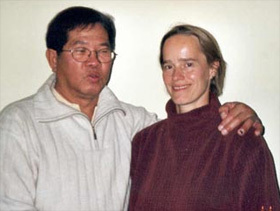 The founder of Modern Arnis, Grandmaster Professor Remy Presas, took her on as his personal student and she traveled, trained and taught with him for many years until his passing in 2001. She continues to travel and to share her skills nationally and internationally in Europe, North Africa and North America, including at Association of Women Martial Art Instructors, Pacific Association of Women Martial Artists and National Women's Martial Arts Federation events. The late Grandmaster Professor Presas appointed Master Roloff as one of his seven successors in November 2000, being the only woman and European in his team. Professor Presas honored her with the title ‘Master of Tapi Tapi’ which stands for the highest level of proficiency in the art of Modern Arnis, which is beyond all black belt levels in the art. Master Roloff's main school is in Hamburg, Germany. She also has schools and students in several cities in Germany and The Netherlands, and students in the U.S. and Canada. Besides Modern Arnis, she also has trained in Chinese and Indonesian arts for a number of years. Professor Remy Amador Presas, the father of Modern Arnis was born on December 19, 1936 in Hinigaran, Negros Occidental Philippines. Professor Presas was inspired at the age of six years old by his grandfather, who taught him the fundamentals of their family style of Arnis. At the age of 14, Remy travelled to various neighboring cities in the island provinces of Cebu, Panay, Bohol, and Leyte to study with renowned experts in the Filipino Martial Arts, including: Rodolfo Moncal, Timoteo Marranga and Venancio Bacon. Professor Presas obtained a Bachelor’s Degree in Physical Education and taught at De La Salle College, the University of Negros Occidental-Recoletos, and various universities and colleges in Manila. He founded the National Amateur Karate Organization (NAKO), International Modern Arnis Federation (IMAF) in 1957, International Modern Arnis Federation in Europe (IMAF Europe) in 1992.International Modern Arnis Federation of the Philippines (IMAFP) in 2000, and the International Modern Arnis Federation in the United States of America (IMAF, Inc.) in 2000. In 1983, Professor Presas published his first book in the United States, called Modern Arnis. Within this book, Professor Presas expressed his innovative ideas of Modern Arnis that were in unison with the novel techniques and traditional applications of Arnis. Through perseverance, Professor Presas made the art of Arnis, an indigenous Filipino martial art, known to the Western world, which achieved the purpose of instilling pride among the Filipino people to be proud of their cultural heritage. In order to further accomplish this, Professor Presas helped the Filipino people revitalize the practice and promotion of the art of Modern Arnis. Modern Arnis was included in the Constitution of the Philippines as the national sport. Professor Presas resided in the United States of America and Canada for many years in order to further this mission and to propagate the growth of Modern Arnis. Due to Professor Presas’s unwavering devotion, lifetime commitment and achievement, the Filipino people were able to restore an essential part of the country’s cultural heritage. Since 1975, Professor Presas travelled continuously on an international level, predominately focusing on introducing Modern Arnis within North America and Europe. Professor Presas’ networking extended to many interview and video shoots including Black Belt Magazine, which appointed him to the instructor of the year and weapons instructor of the year. For 18 years he conducted the ‘Big Three Seminars’ with Professor Wally Jay and Professor George Dillman. While on tour in Europe, with Gabriele Roloff, and Astrid Zimdahl, director of IMAF-Germany, Professor Presas was not feeling well and was exhibiting neurological issues that were out of the ordinary. After undergoing extensive medical tests in Germany, he was diagnosed with a right-sided brain tumor and received therapy to control his symptoms and he was discharged in stable condition and transferred to Canada for medical treatment. Subsequent to stabilization of his neurological symptoms, Professor Presas disclosed explicit intentions and instructions for the International Modern Arnis Federation (IMAF) and its future. During this period, Professor Presas instituted succession planning for IMAF, in which he declared the award of Master of Tapi-Tapi, within the art of Modern Arnis and recognized the following IMAF members, in alphabetical order: (1) Jeff Delaney, (2) Chuck Gauss, (3) Jim Ladis, (4) Gabriele Roloff (Germany), (5) Randi Schea, M.D., (6) Ken Smith, (7) Brian Zawilinski. Professor Presas was very clear in highlighting and differentiating the status of Master of Tapi-Tapi versus a degree rank. According to Professor Presas, the Master of Tapi-Tapi is for "recognition for having achieved the highest level of proficiency in the art of Modern Arnis" since its creation in 1957, and its introduction in 1975 in the West. Additionally, the title of Master of Tapi-Tapi is an achievement award, as awarded to its recipients to ensure the longevity and legacy of Modern Arnis, a declaration of commitment by the recipients to continue to keep Modern Arnis open and active for its practitioners, and is an honor and responsibility of the highest level awarded by Professor Presas. The mentioned seven recipients of the Master of Tapi-Tapi honor were appointed by Professor Presas to serve on the Steering Committee for the IMAF organizational responsibilities. In addition, Gabriele Roloff, Director IMAF - Europe, was recognized by Professor Presas for her life-long commitment to Modern Arnis and for her support and care of him during this period of illness and was asked to continue her ongoing work to promote the growth of Modern Arnis in Europe which she was doing as the the director since the IMAF Europe was founded in 1992. Professor Presas passed away on August 28, 2001 at the age of 63 in Victoria, British Columbia, Canada. His body was sent to the Philippines and laid to rest in his place of birth. Professor Presas is survived by his second wife Yvette Wong and their two children Joey and Remia, his five children from his previous marriage, as well the thousands of individuals and students who still love him.